What size are the photo booths? We also require about 1m around the booth sizes above so that we can attach the outer skins. Do the booths come with a member of staff? Our booths are always staffed with a fun, friendly and interactive member of staff. Do the packages come with a USB stick? Please check what the package you have selected includes. Alternatively you can purchase one of our branded USB sticks with all your images on it, please enquire prior to your event. Does my package include a guest book? Please check what the package you selected includes. Alternatively, you may be able to purchase a guest book and second set of prints, please enquire prior to your event. How long does it take to set up a booth? We always like a minimum of 1 hour to set up a booth. (This can vary if access to a venue is tricky). How long does it take to dismantle a booth? We always like at least 45 minutes to dismantle and remove a booth. (This can vary if access to a venue is tricky). In order to secure your date we require a non-refundable deposit. We will then email your booking form for all the important details i.e. message on the prints etc, then once you have completed it and emailed it back to us, we will email your contract that we will both sign electronically. You will be emailed a copy for your records. Full balance is due 12 weeks prior to the hire date. In the event that a booking is made less than 12 weeks prior to a hire date, full payment will be due to secure the date then booking form and contract will be emailed as above. All agencies and corporate bookings will follow the same booking process. Terms and conditions are available upon request prior to booking. How do I pay to hire a photo booth? Payment is recommended via online bank transfer. If there is a travel charge to your venue we will include this in our initial quote to you. We have PLI insurance to the value of £10 million. Yes, when our booths reach 1 year old we have them PAT tested and have certificates to prove this. How many people can get in the photo booth at time? As all of our photo booths are seated, the maximum amount of adults allowed in the booth at any one time is 4. This is because there simply isn’t the room for any more people and with the lighting in the booth it becomes extremely warm & uncomfortable. The Selfie Tower Pod can have more people per photograph because it is open air. 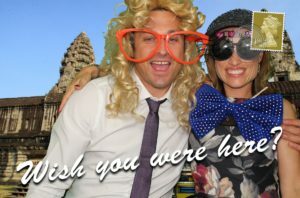 Where is the best place to have the photo booth set up? We would always recommend having the booth set up prior to your guests arrival as it creates an overall WOW factor when built up and ready for use. If our venue has a separate room that we can set up in, this is often the best place for the booth, meaning that our staff will not have to disturb guests when removing the booth. All we need is a plug point, plenty of space (about 1m around the booth frame sizes above so that we can attach the outer skins) and plenty of people ready to have fun in the photo booth! Can the photo booths be set up outside? The booths can be set up outside providing that there is a solid surface i.e. concrete (not grass) for the booth to be set up on. The client will also need to provide cover for the booth for the duration of the hire in case of inclement weather – water & electrics will not mix well! There will also need to be an easily accessible power supply. Can we have backgrounds to match our theme? Of course you can! Our design team would love to make your photograph backgrounds personal to you. All you need to do is select the Action package and tell us your theme and we will do our best to create images to match! What happens if there is a technical failure with the booth? Fortunately this has never happened with our state of the art booths, but if it did, we have 24 hour telephone support from the manufacturers so all we have to do is call them. If there is a wifi connection they can even access the booth remotely but a phone call would usually suffice. We also carry an array of spares in case of any mishaps!